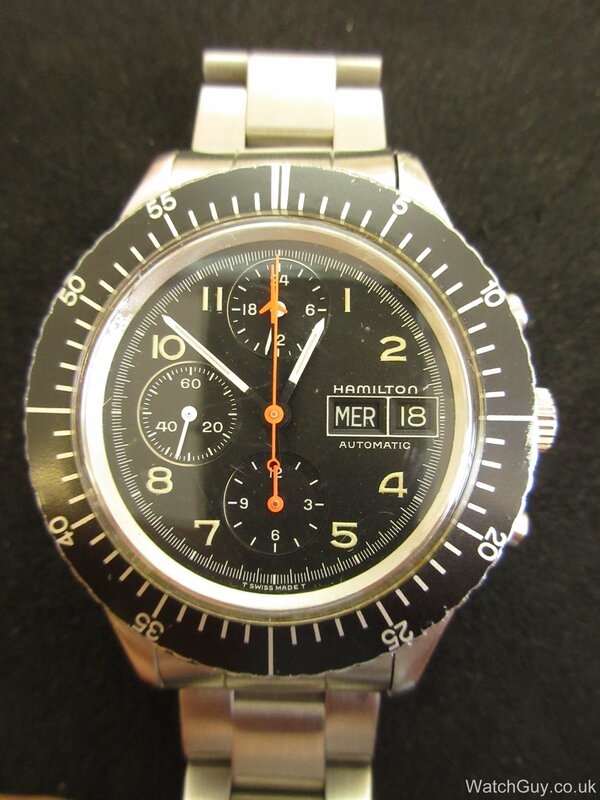 Time for one of Anders’ watches again, and this time it’s a Hamilton Chronograph with the Lemania 5100 movement. 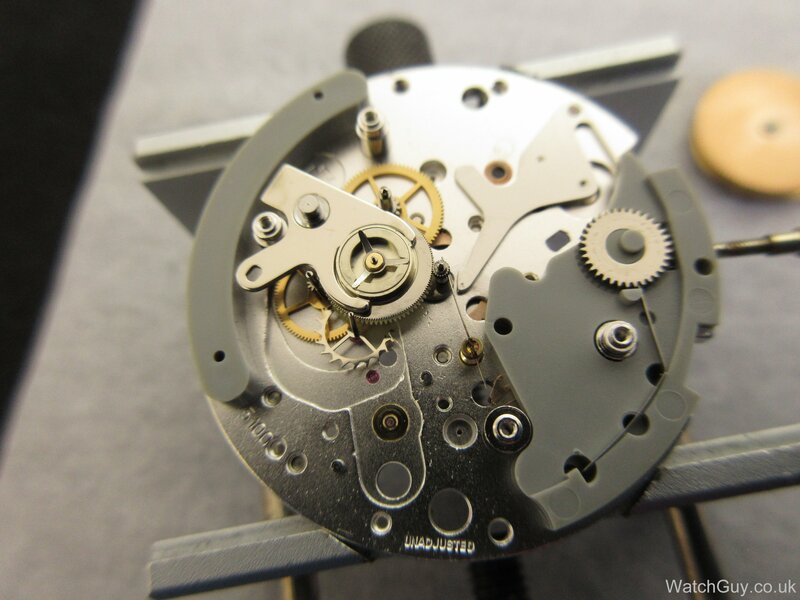 So quite a comprehensive list of features, and, on top of that, it’s a military grade movement that can withstand large shocks without the chronograph stopping. 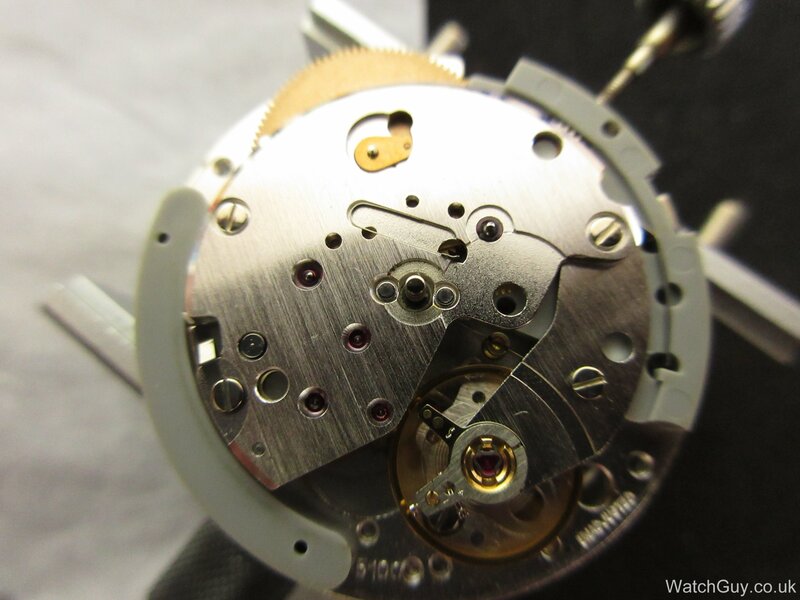 All that puts the movement high up on the top list of chronograph movements. But, there is a downside to all this as well, and we will get to that further down. Performance is pretty bad, so it’s definitely time for a service. The two grey nylon blocks hint at the extensive use of the stuff. No less than 7 hands. 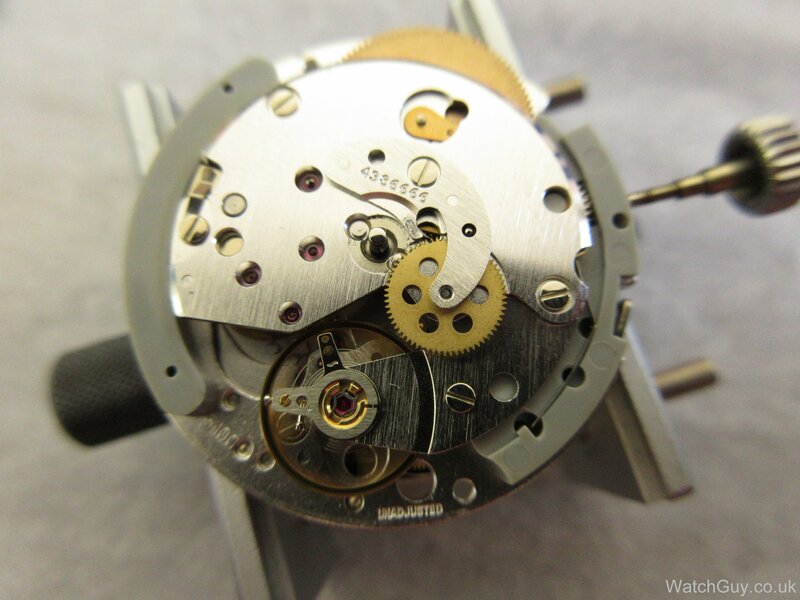 The barrel can be removed without taking the movement apart, by pulling the central arbor (at 11.30 o’clock) out. The wheel / barrel bridge removed. 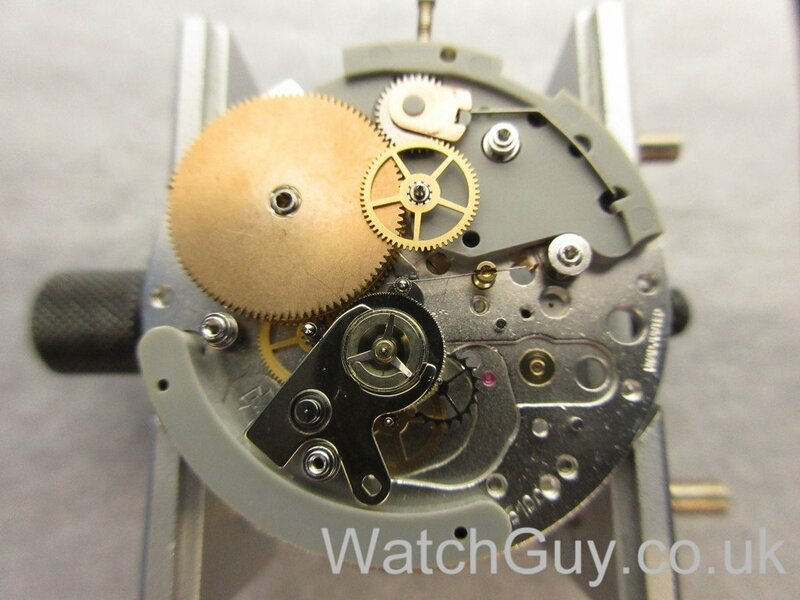 The movement is in very good condition, with the nylon parts pristine. Above the balance is the vertical clutch / fourth wheel that drives the chronograph components on the other side of the plate. 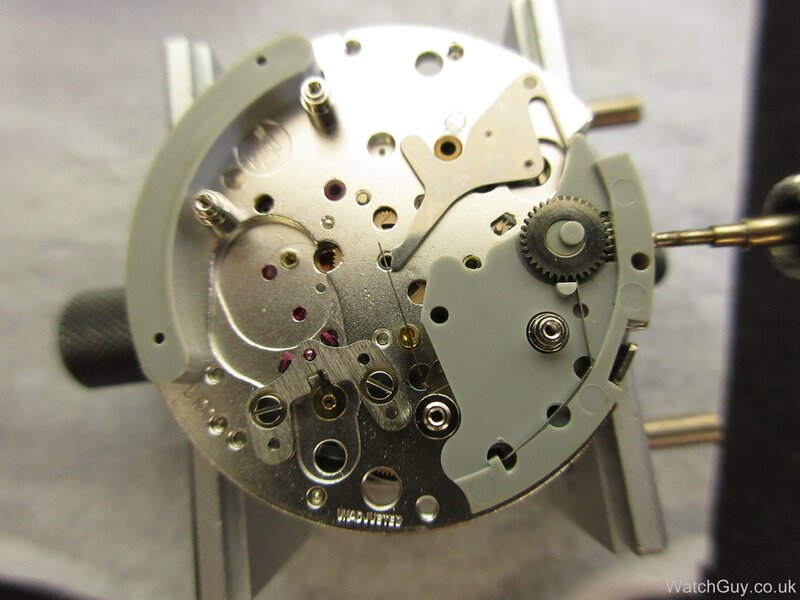 This is the same clutch construction that Seiko uses in their chronographs, and it’s what gives this movement its excellent shock protection. Here is the vertical clutch, and half of it is nylon, too, which will add to the capability to absorb huge shocks. The plate with the hammer at 2 o’clock. The bottom plate has a day and date disc. 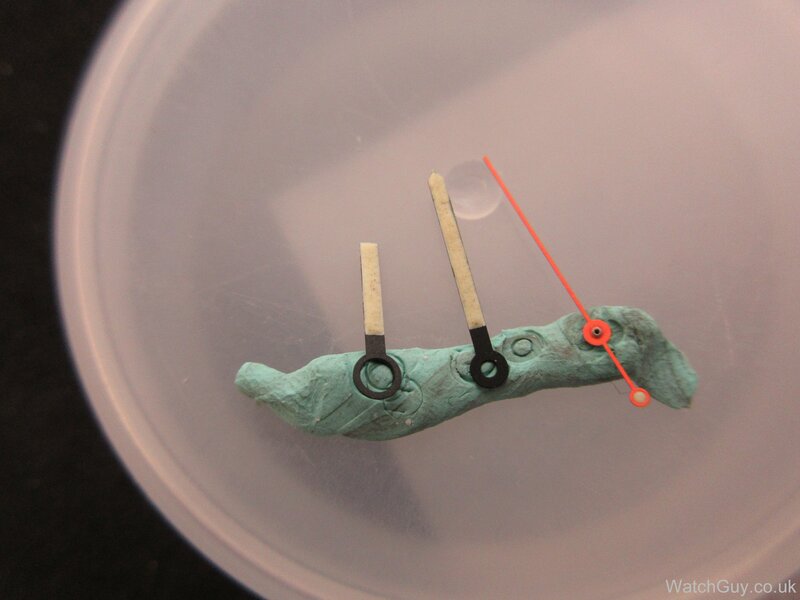 The tube of the sub-hand got stuck on its arbor, and I carefully have to remove it. No lack of nylon here, either. 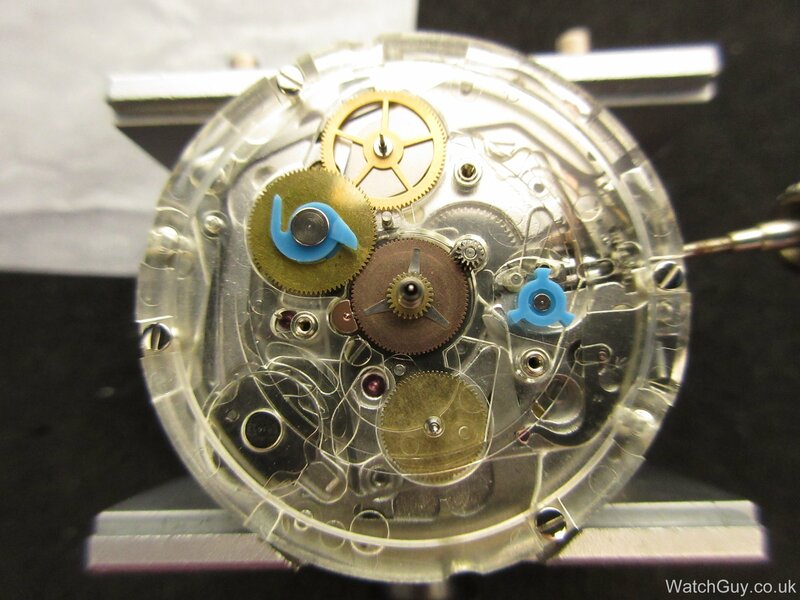 The plate covering the chronograph mechanism is of clear plastic. It’s important not to put this stuff into the cleaning machine. The nylon is fine, but the clear plastic will turn milky if put into the cleaning fluid. The chronograph mechanism is made of fairly easy to machine parts. 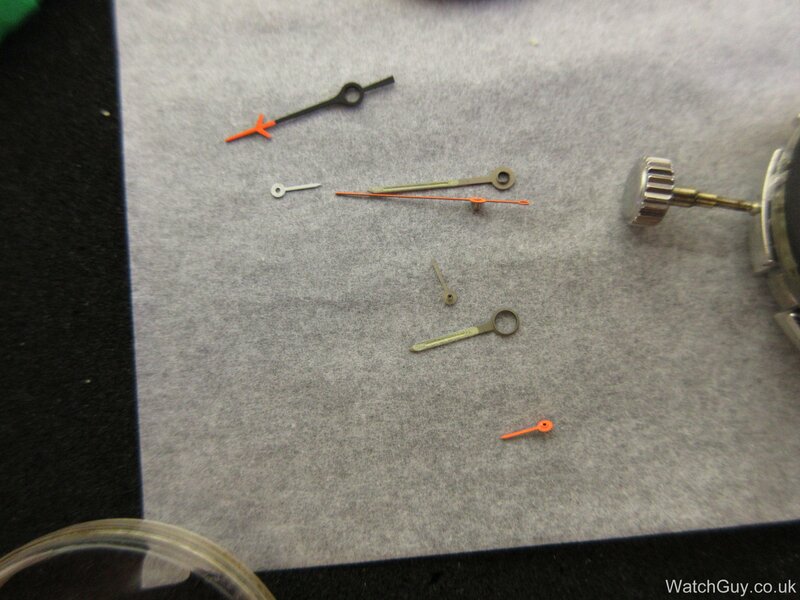 All the parts are cleaned and ready to be put back together. 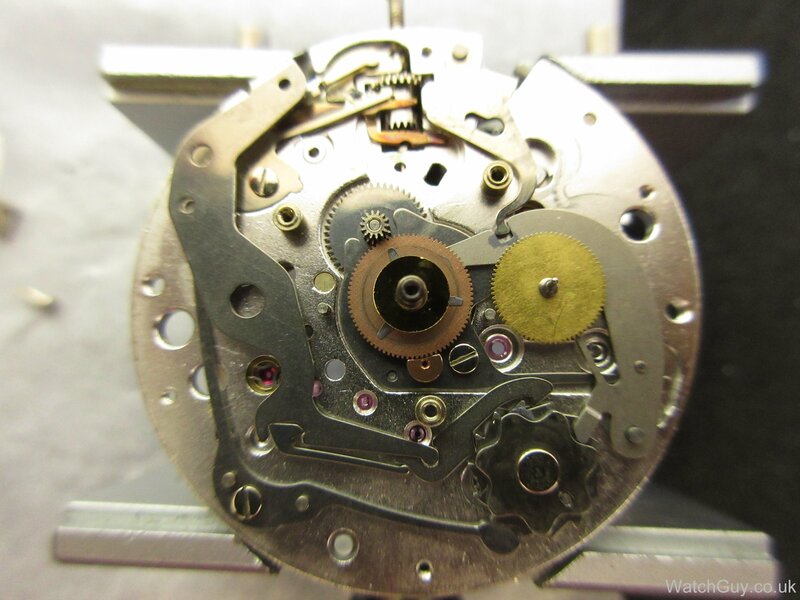 I start on the bottom plate, so that I can fit the central chronograph second runner. And I’m ready for the bridge. The bridge is on, and the movement is beating. Very nice performance, so nothing to complain about here. The chronograph layer is back in. And the day and date disc are back on. 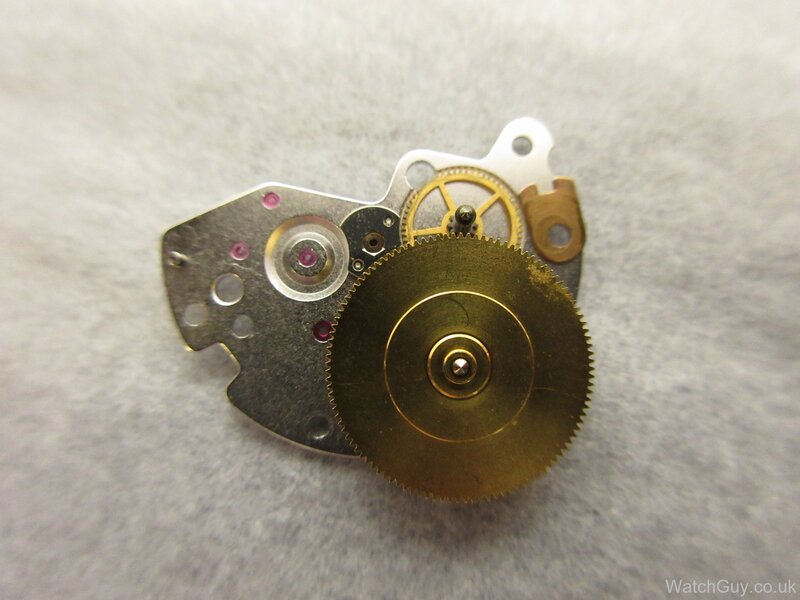 With the auto winder oscillating weight put on (the auto winder is unidirectional), the movement is ready for casing. 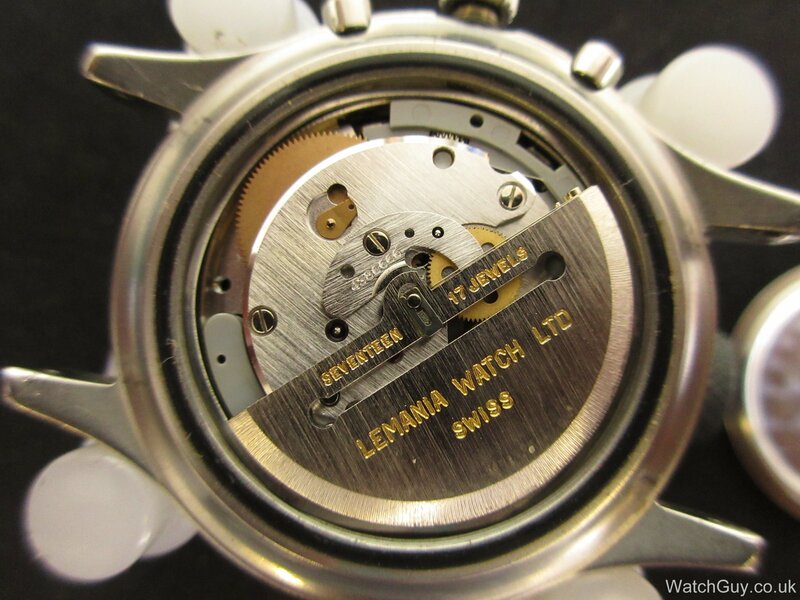 Anders supplied a new dial and hands (Lemania branded). The hands are on, bur Anders wants a darker lume colour. Here we go! Cased and ready for action! For me, the advantages of this movement outweigh the downsides. Whatever you make of it, it’s a very interesting construction, and a good piece for any collector. 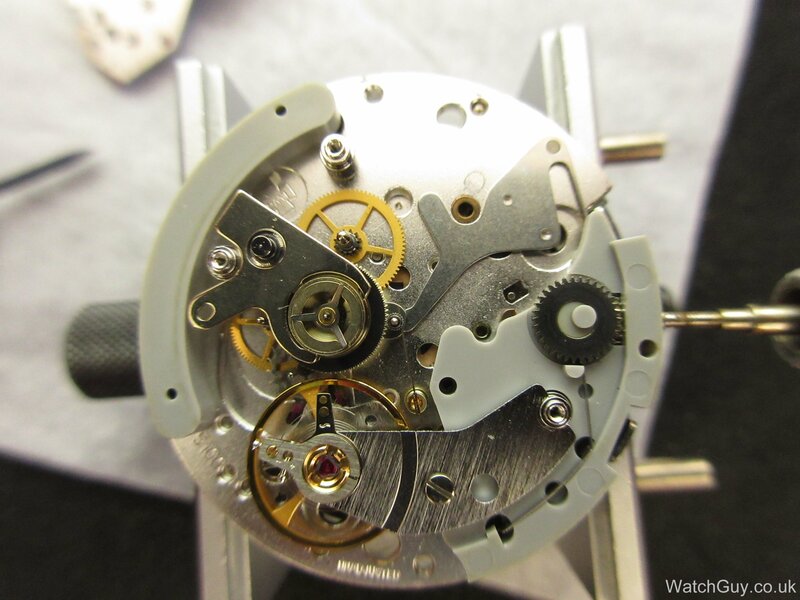 Hi, Great article, I have taken my Omega 1045 into a local watch maker because the chronograph minute hand would not return to 12 o’clock at times. He has now informed me that the part that the return pusher activates has become weak and needs to be replaced. He now says he cannot find this part. 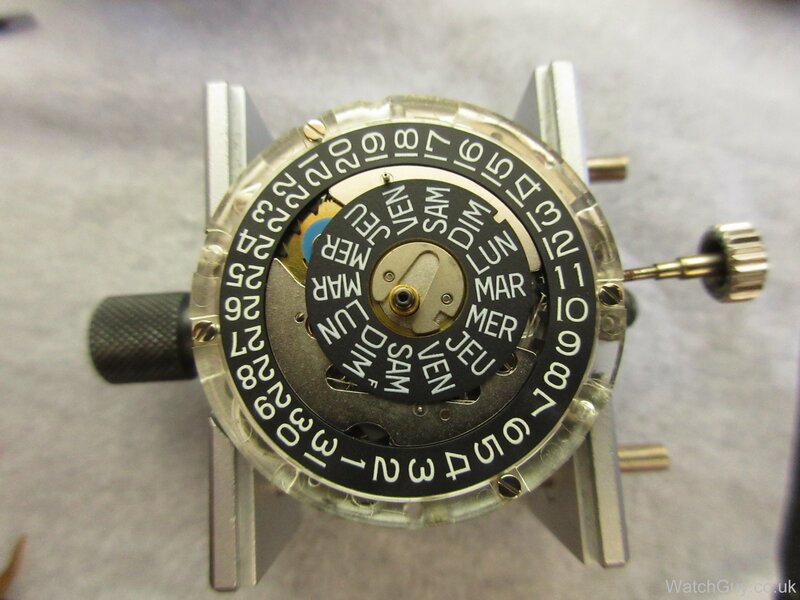 Can you help with either the part number and or a supplier where I could find one please? I probably have what he is looking for. 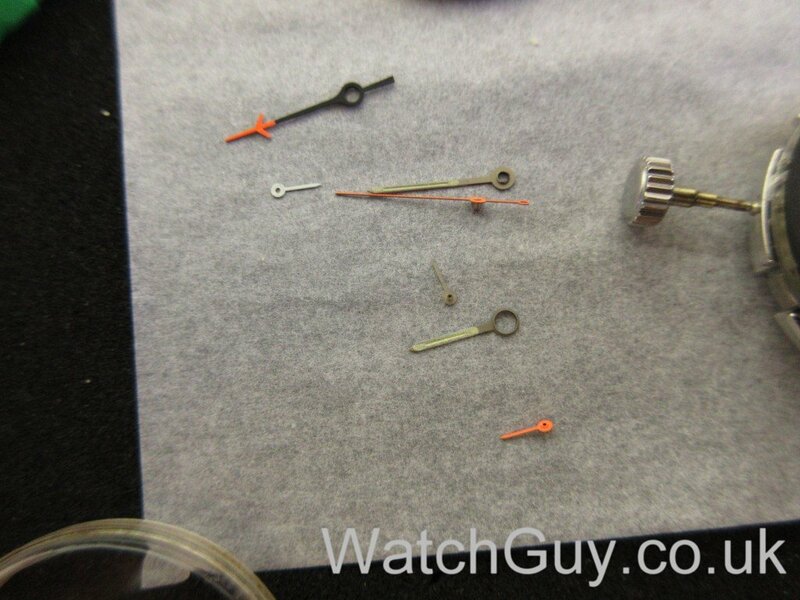 Let him check at watchparts.org.uk – all my stock is listed there. Good day, I would appreciate some advice. 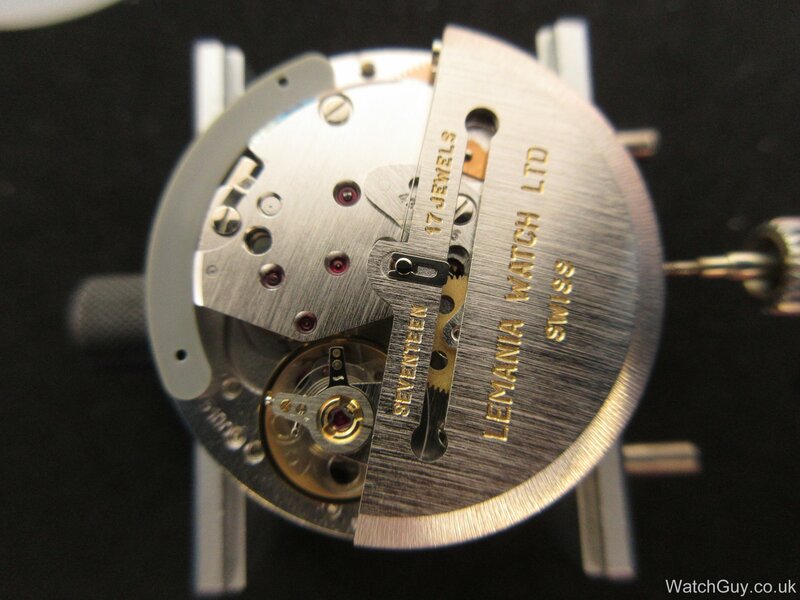 I own a Fortis B42 Cosmonaut Titanium (limited edition) with the Lemania 5100 movement. 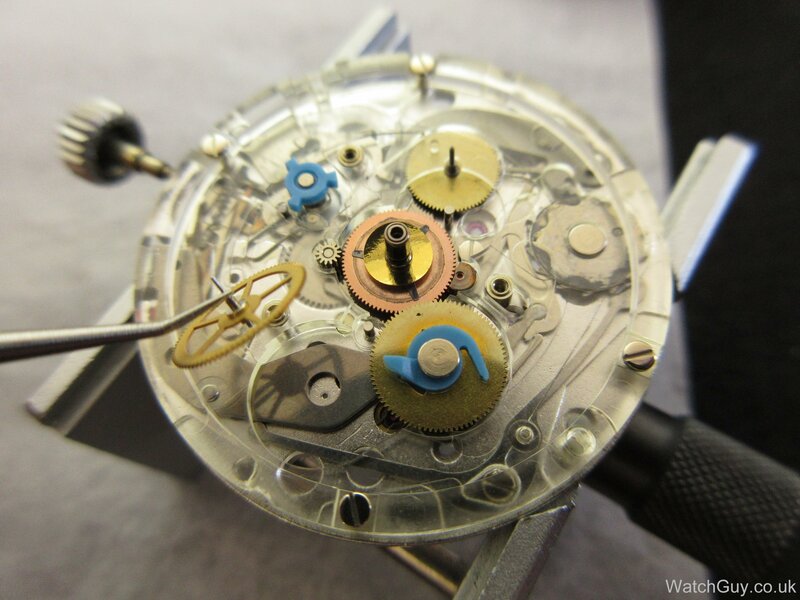 It is currently with a watchmaker for a service. The 24 hour hand at “12” is erratic and the diagnosis is a bent 24 hour wheel. 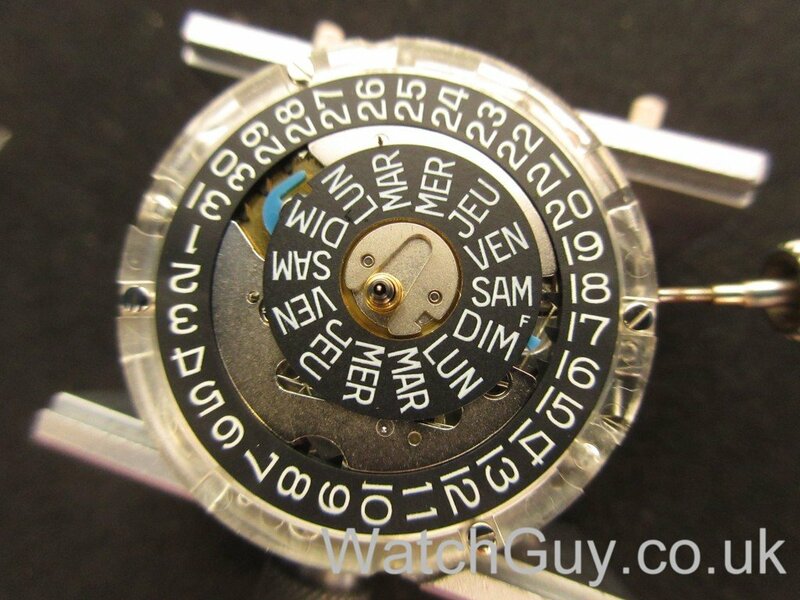 We cannot find one from Fortis. 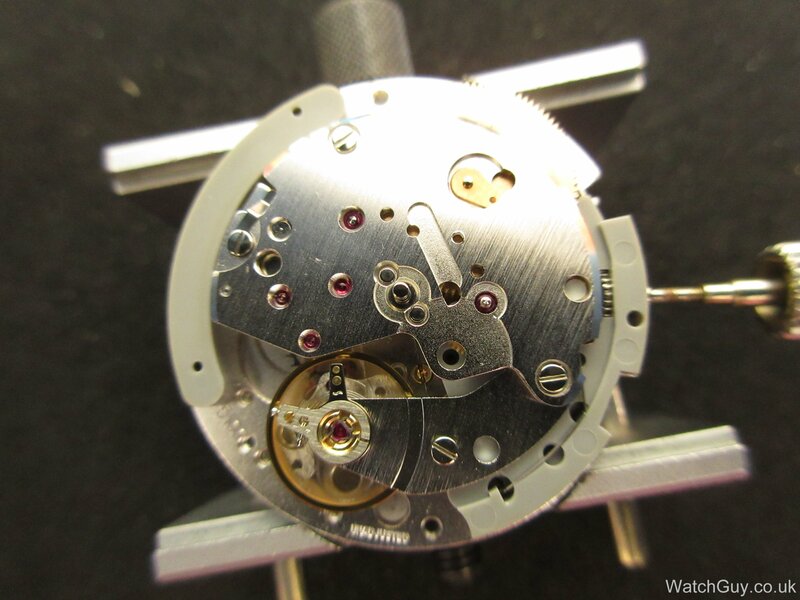 Would the corresponding Omega cal 1045 part fit the Fortis or won’t these parts necessarily be similar? I appreciate your response. Albert Kotze. The Omega part should fit. 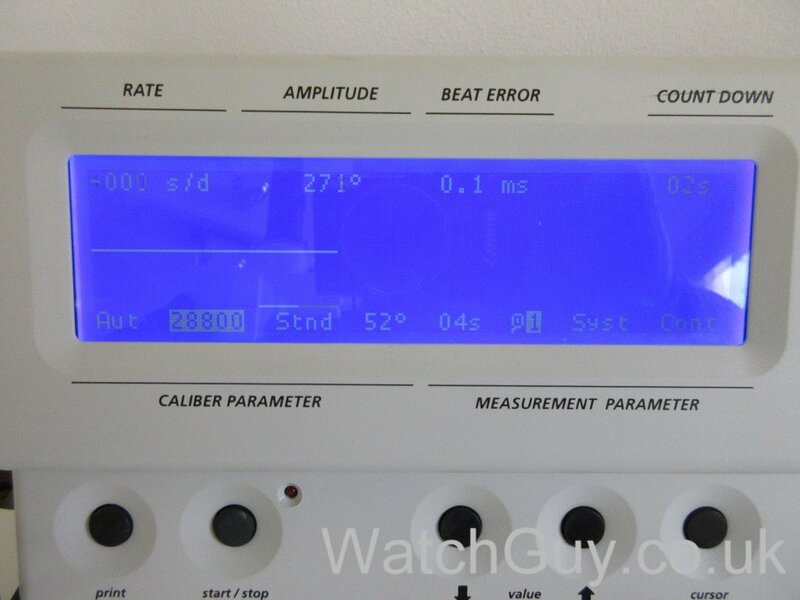 Check on watchparts.org.uk – I might have it in stock. 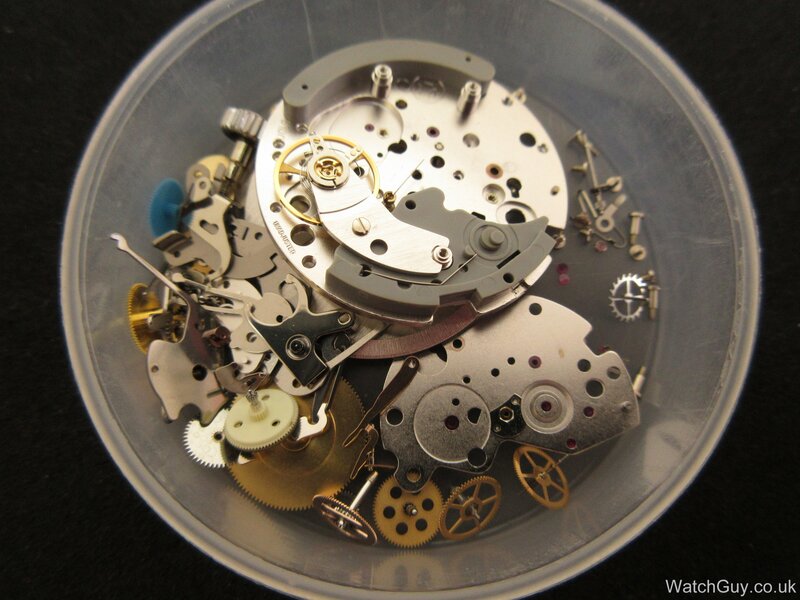 Hi Anders, What a find, I have an Omega with the 1045 and the plate covering the chronograph mechanism on mine is totally stuffed. As soon as I removed it it crumbled into a hundred little pieces. It Seems Omega do not supply these parts anymore. Can you tell me if you can or where I can source one? I sold my last one a couple of months ago. Best keep an eye on ebay. Sorry if I bother you. 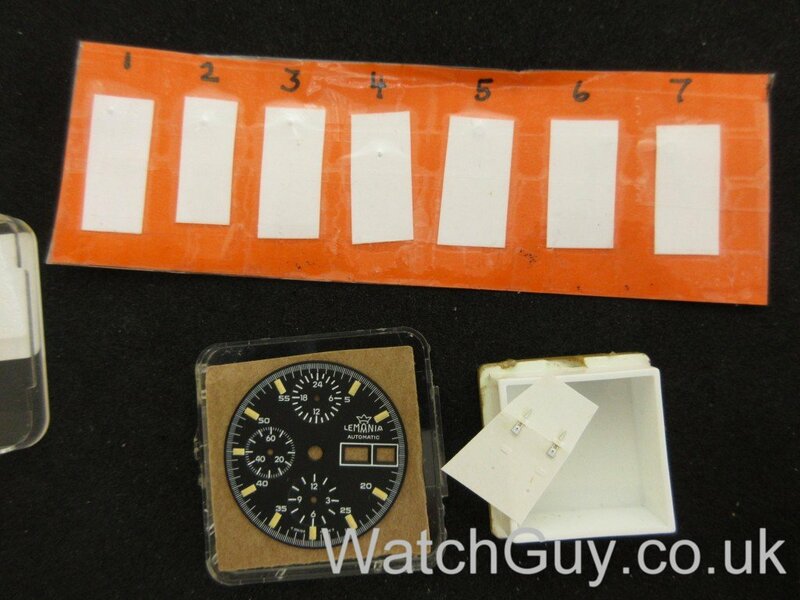 I am lucky to own the Fortis B42 Cosmonaut chrono with the Lemania 5100 movement. 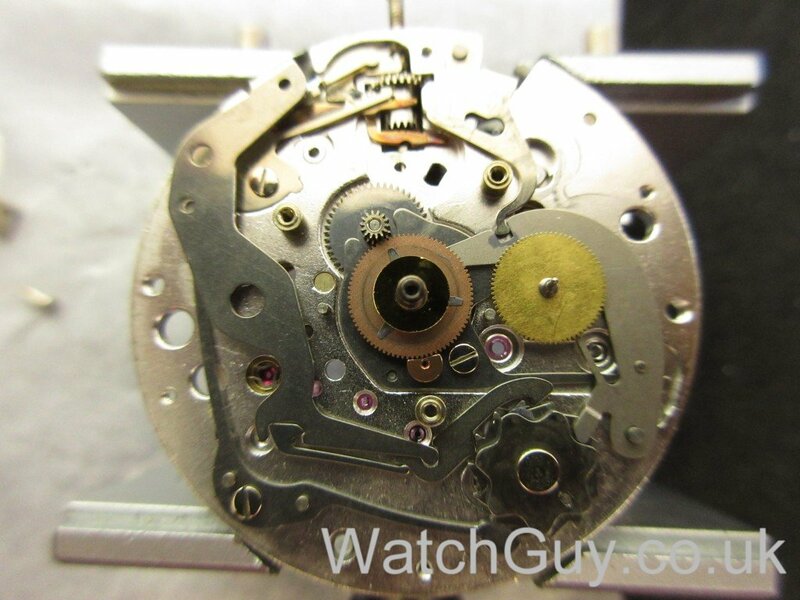 A while ago it stopped winding on the winder and I took it for a service. My watchmaker informed me that the rotor bearing is shot and that he does not have one. He “serviced” the existing bearing and that worked for half a year but now the problem returned. It seems to me that the bearing is not part of the rotor and that the problem can be solved if I bought just the bearing. Am I correct that I need only a bearing? Fortis does not have the rotor any longer. Thank you for your consideration. It’s either the rotor post or the bush in the rotor that is worn, or both. 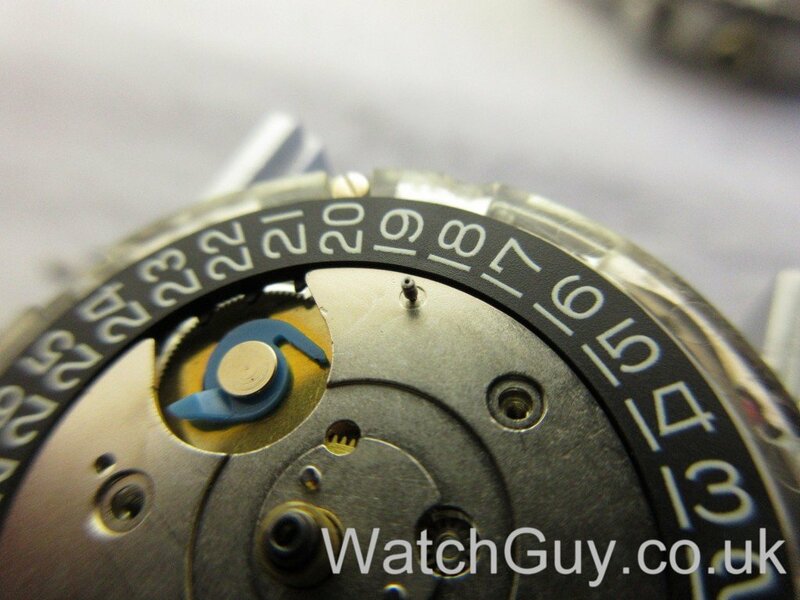 I can’t tell from here, so that is a question for your watchmaker. These parts aren’t generic, so you can’t just buy a “bearing”. IWOuld an Omega rotor be good? I won’t like to do that but that is now my only option. They appear the same but are different in many ways. They’re different watches. 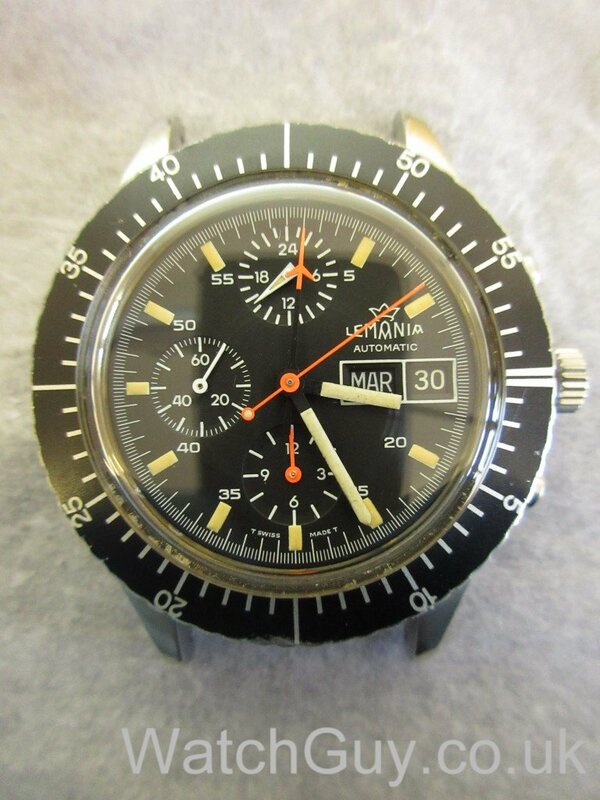 I have a 40’s/50’s era Lemania chronograph that needs service to the chrono. Do you service/restore client watches, as well? I will send you an email in a minute. I’ve been looking for precisely that Hamilton, but I do prefer it with the Lemania dial without numbers. Nice work. 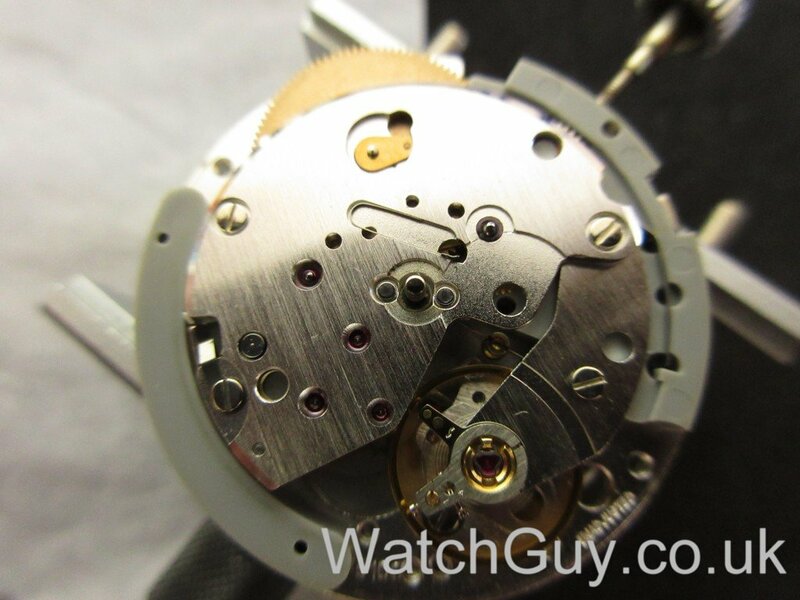 what was the reason for servicing the watch ? was the watch going slow or was gaining time, i have a fortis 5100 and it gains aalmost a minute per day. I really love your website, your work is nothing short of amazing. I have a quick question for you if you have the time: I have an Omega “Mark 4.5” with the Lemania 5100. 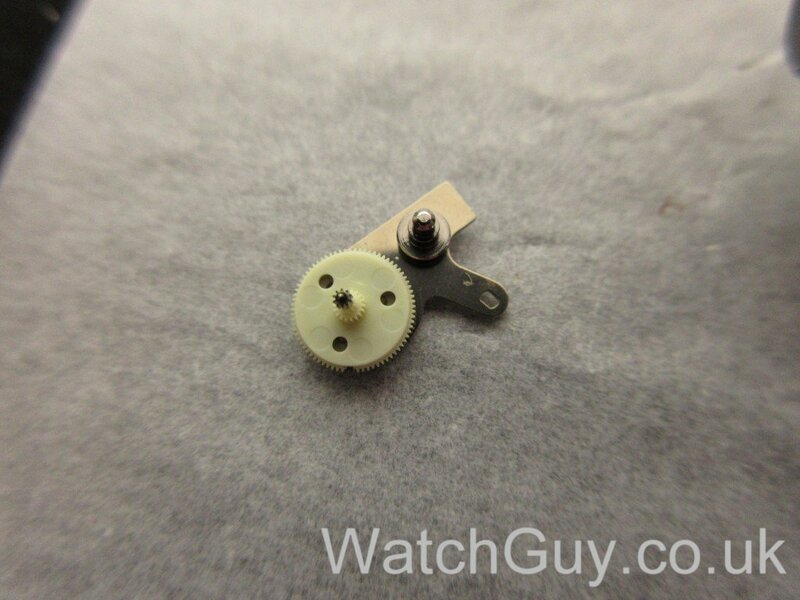 As you know, the rotor is not screwed but instead held in place by a small clip. 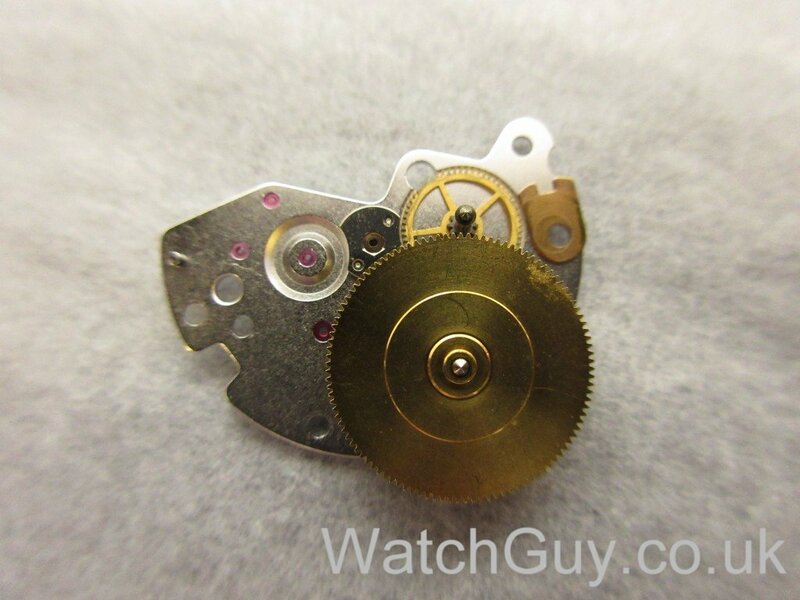 The rotor on my watch has a bit of “play” in it, it rotates perfectly smoothly, but if i hold the watch vertically between my thumb and forefinger and shake it a bit, I can hear the rotor “clicking”, like it was not held down tightly by the retaining clip. Is this normal for the 5100? Thanks and I hope you keep posting these great articles. The retaining clip does not determine the side shake of the rotor, but the rotor bush does that, which is probably worn. I just checked, and the rotor bearing is still available, part number 1045-1402, for a very reasonable £13. If you have bad luck, you will also need the rotor post 1045-1400, which is available for £22. Anders, great choice about changing the dial, I’m with you 1000%!!! I love the end result, it is much better looking in my opinion. Well the legacy of the 5100 movement (plastic parts plus most of the original mechanical designs) still lives on in the current ETA C01.211. Kind of, but there’s loads of cost savings and a lesser design in several ways. 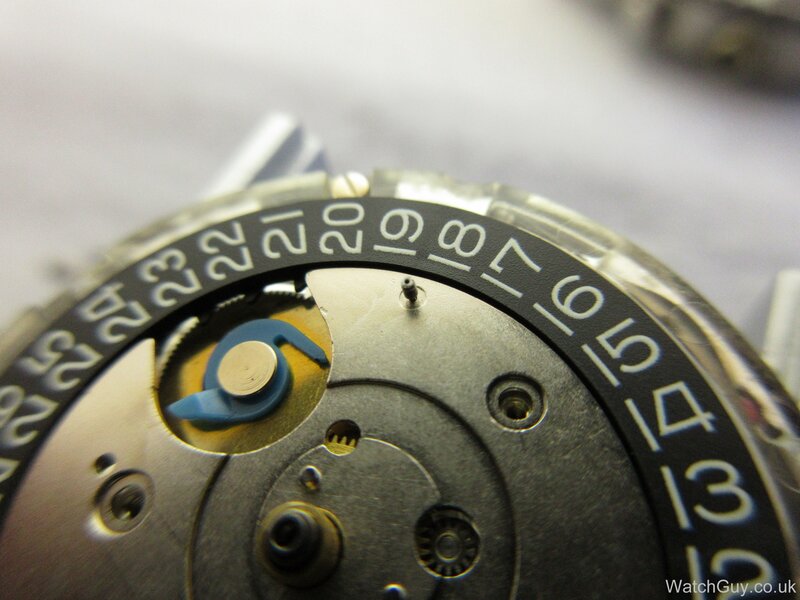 The Central Chrono minute counter is missing 24h indicator likewise. The legacy kind of lives on, but it is far from an improvement. 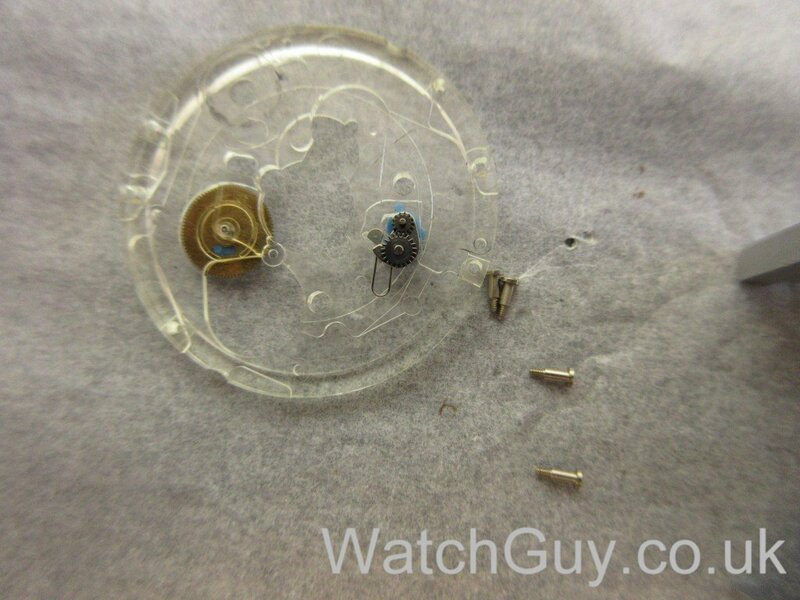 The plastic in the 5100 is DuPont Delrin. I learned this when I bought a Lemania twin pusher chronograph (cal. 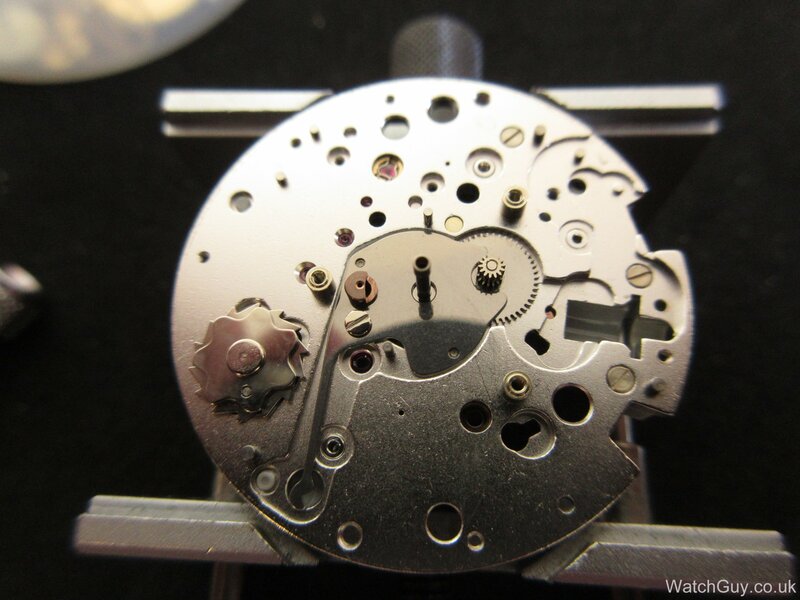 1872) and saw the brake while my watchmaker had it opened for overhaul. I was concerned about the durability of this part so I asked on a watch forum whether it might not be advisable to replace this (Delrin) brake with one of metal. Answers I got reassured me, with one forum member saying that Delrin was tough stuff: the plastic is, according to him, “strong, dimensionally stable, self-lubricating, and doesn’t absorb moisture.” He went on to add that some of the bushings for the flight controls in his airplane are made of Delrin, as are the receptacles for the pins that keep the plane’s canopy closed in flight. So, a long-winded defense of something that didn’t really need defending, I guess. But we’re used to thinking “cheap” when we hear something is made of plastic, but that’s not always the case. Lemania, after all, has a long record of producing quality movements for some of the great houses, and if they chose Delrin for some purposes, who can question their choice? Hey Anders, congratulations on such a beautiful watch! 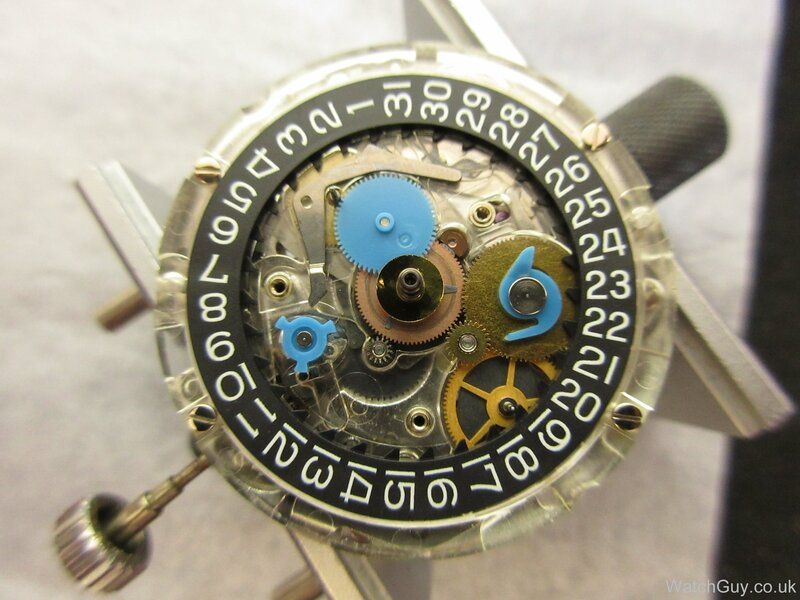 I was surprised to get to the end and see the dial swap, but it’s in such great taste and looks so perfect on that watch. Well done! 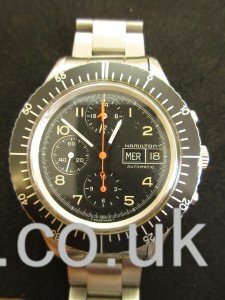 If you ever want to sell your black Hamilton dial, drop me a line. Thanks Christian, for another well executed job. 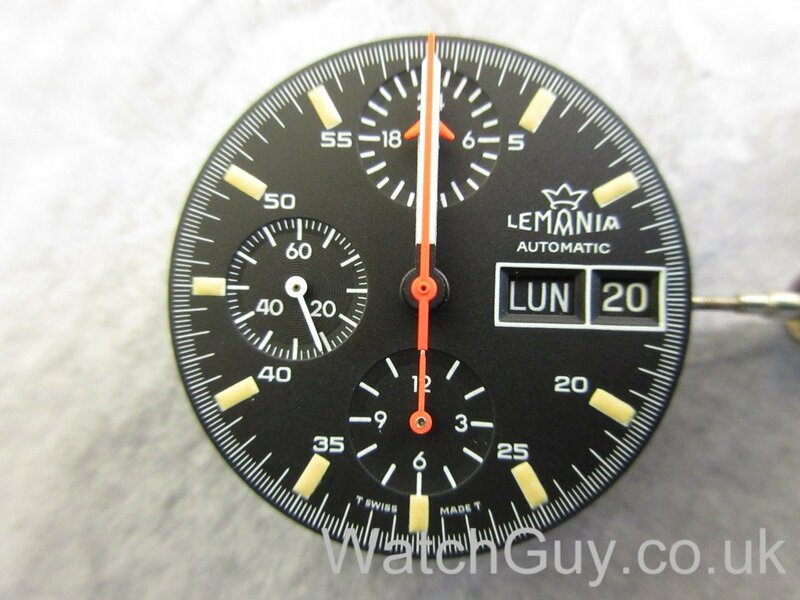 People may ask why I went for a Lemania dial, and not keep the Hamilton it came with? There are several reasons, like it actually having originally been made fully by Lemania. But the key is that this watch will be used (by me), and I am a big fan of Lemania. 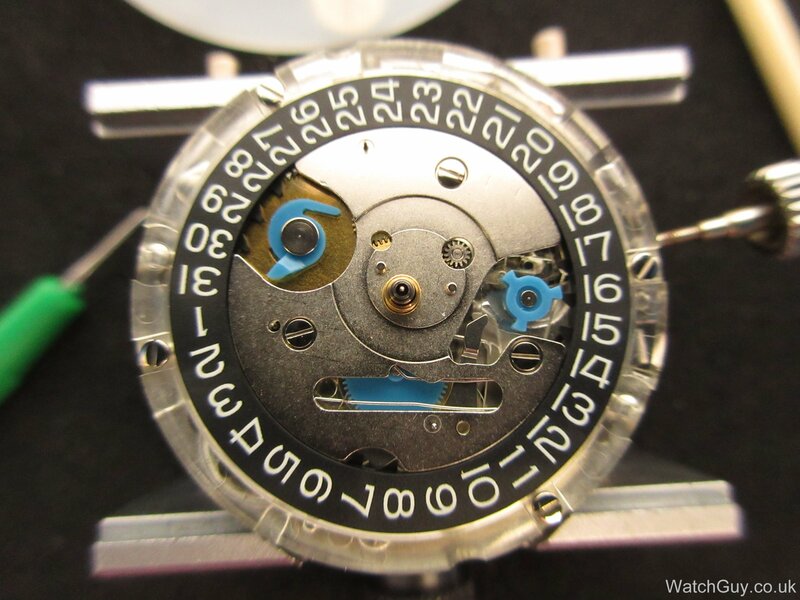 The 5100 is one of the ultimate “tool watch” constructions, and it was never intended to be a piece of collectors jewellery. I had the dial, and hands in the drawer, and when this came along it just lined up nicely. The 5100 construction has been criticised for the industrial finishing and use of plastics. There are also grades of plastic, and the synthetic materials in the 5100 is at least of a proper quality. The Lemania signature “sweep minute counter”, basically the hand with the orange “aircraft” at the tip, makes it also the best readable design. Even with my degraded 40+ eyesight I can still use it without glasses. Thats no longer the case with the V7750 and other movements alike. 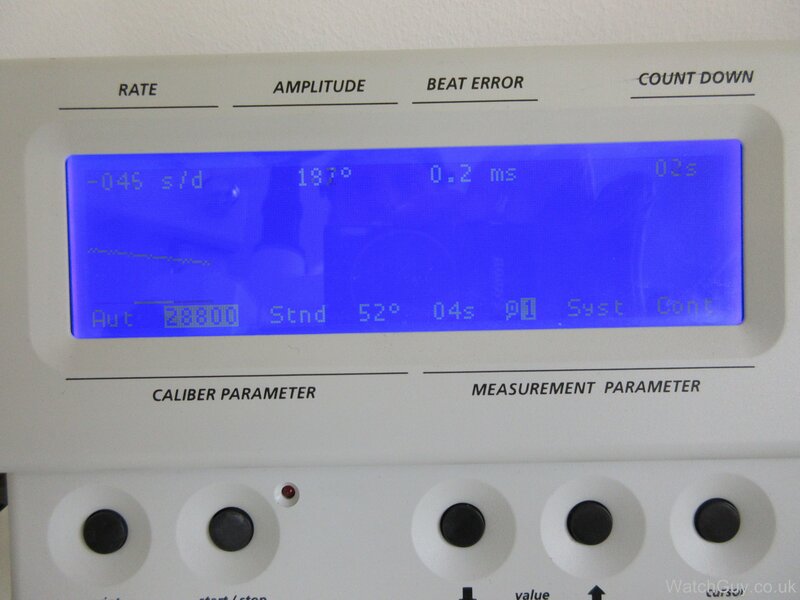 The small subdials are getting blurry…. The original dial and hands will of course follow the watch if I ever would pass it on, but that again is not very likely. The case and layout is identical to the Sinn 156, a watch that Sinn intended to supply to the German Army (Bundeswehr). The 5100 has also been used extensively by other armed forces around the globe.